As Simon pondered the viability of down climbing another steep section soaring above, it occurred to me that we were going to run out of time. We were at 1,430m and the summit was a further 250m above. Yes, we’d climbed the crux alright, but the highly exposed, relentlessly steep terrain above the crux still wasn’t conducive to fast travel. We had to be back down at sea level by 5pm for our Roscos Milford Kayaks water taxi pickup and, between us and the water line was difficult terrain most of the way. Adding to the challenge was a lack of water and we knew that rushing a tough, exposed route in a dehydrated state was a recipe for trouble. “I think we’re going to run out of time guys” I said. “Maybe, let’s discuss it and make a call” replied Caro. Simon stepped down off the next little vertical stairway and asked “What’s our height?” “1,430m with 250 still to climb” I replied. “It’s taken us about two and half hours to get here. Maybe another hour to the summit. Down climbing won’t be much quicker than going up with this level of exposure. Say mid-day by the time we reach camp. We know we’ve got a four hour descent from there and we’ll be tired and dehydrated. Making the 5pm pickup is doable but leaving no margin for error.” We all agreed. The view from where we sat was sufficiently awesome, we already had the satisfaction of climbing the crux and our fifty plus year-old bodies wouldn’t appreciate conforming to such a tight deadline. Added to this, the forecast was for a change to rain and we could already see cloud building around us. The thought of descending the steep, dense Fiordland bush beyond the treeline in the wet made me grimace. Down we went. This image - Near the notch at the far end of the horizontal section, about 1,250m. This image - Looking down to the notch from the its upper side. I’d been keen to climb Mitre Peak (1,683m) for some time. Though under 1,700m, the climb begins at sea level, so it’s still a significant undertaking. And the peak is just such an icon. A real postcard celebrity, photographed by nearly every international tourist who visits our South Island. The previous summer another Alpine Club friend, Mike Neely and I had come south to have a crack, but the weather was poor in Fiordland so we went up to the Annette Plateau in Aoraki National Park instead. This time I was with two other Alpine Club friends, Simon Williamson and partner Carolyn Ellis and our luck with the weather seemed to be with us. We’d just enjoyed two magnificent days doing the Ball Pass route, followed by a rainy travel day down to Homer Hut. Now the weather had cleared again – windy on day one but calming on day two, before another front was forecast that evening – it was on. On day one we had to be at Roscos Milford Kayaks’ departure point at Deepwater Basin for 6.30am. A return trip per person is fairly pricy at $120, but this includes a walkie talkie and on the hill comms and their team is very friendly. The first challenge, aside from enduring the hoards of sand flies, was actually getting ashore with a hefty water-laden pack. There’s just a small band of slippery rock between the boat and bush. We all made it without anyone getting wet. This image - Heading to the trail head just north of Sinbad Gully stream, after our water taxi dropoff. Anyone who’s been in Fiordland bush knows how dense it is. We had a steer from our water taxi skipper, Dion, as to where the trail actually began a little to the true left of Sinball Gully stream. Just as well because, at our drop off point, we were confronted with a wall of forest. 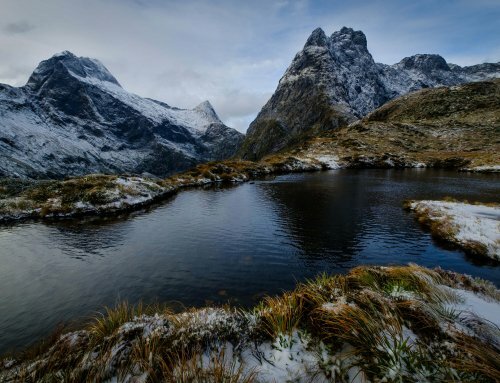 If Trump wants to build an impenetrable wall around the US of A he should check out Fiordland – not only would he keep out uninvited aliens but also gain carbon credits. The first five hundred or so metres is probably the toughest – relentless up, root ladder after root ladder, pack snags, constant risk of going off route. We did find later that coming down it was easier to follow the trail, but we still lost it for a while about 200 metres above the sea. At 541m we reached the first ridgetop. After that the going was a little easier up to the Footstool at 832m, where we got our first decent view of the upper section of Mitre Peak. And yes, it looked steep. This image - Our first good view of the upper section of Mitre Peak from the Footstool (835m). From the Footstool was a 150m steep descent to a saddle where we encountered the first of two small campsites. At the first was a pan, half filled with rain water – an unexpected bonus given the lack of water sources on Mitre Peak. A little further on, at 730m, was the second campsite where we decided to stay. Later Simon discovered a nearly dried out tarn nearby, where he scrounged a couple of extra murky litres of water which we thoroughly boiled for tea. Water is an issue. In such tough terrain you need plenty, but you have to carry it, which makes pack lugging more arduous. We also carried a 60m rope, harnesses and a few slings. Depending on who you talk to Mitre Peak is touted as a straight forward rock scramble through to a truly epic undertaking. We took the gear just in case, but that only added more weight to our packs. As it turned out for us, the truth was somewhere in between. If we’d had more time I’m certain we would have free climbed the entire route and my background is not a rock climber. But unless you’re an Alex Honnold kind of guy, the yawning exposure can’t be ignored. Climbing up or down the upper sections of Mitre Peak is a mind game to some degree. I was acutely conscious much of the time that a single misplaced step or careless hand hold would end in a freefall to the fiord. This image - Our camp at 730m. One of the locals pays us a visit at camp. A view down the ridge to Milford Sound from about 1,200m. After establishing our camp we rested in the sun until the sand flies drove us back into action. It was too windy to contemplate going for the top that day, even though we still had enough daylight. But we did scramble up out of the bush (about 950m), past the high snow grass campsite (about 1,050m) and on along the exposed rocky ridge as far as the south eastern lip of the notch (1,300m). Though gusty, the sky was a brilliant cobalt and the views from the often knife-edged ridge were magnificent. At one point a gigantic cruise liner came in to view 1.3 vertical kms below us, appearing like a bath tub toy. Looking at it made me thirsty as I pondered our limited water supply and the unlimited beverages being consumed below me. Oh for an ice cold beer! This image - A view down the ridge to Milford Sound from about 1,250m. Simon and Caro were in their tent overnight. I was under the stars and a sand fly head net in my bivy bag. Once the sand flies ceased their sieging of my head about 10pm I enjoyed the night sky and noticed how the wind eventually dropped away altogether. We set off for the summit just after 6am and enjoyed the sunrise as we ascended now familiar ground up to the notch. We had decided to leave the rope and harnesses at camp and travel as light as possible. When I first reached the lip of the notch I wondered if I’d somehow gone off route again. It was a sheer drop into an uninviting void below me. But on closer inspection it became apparent that there was actually a very steep but quite reasonable trail dropping down from the lip to the narrow notch. What rose up on the other side looked somewhat more intimidating and I could see then why this section was deemed the crux. Should we have brought the rope after all? This image - Looking down from the east side of the notch, with the crux of the upper section of Mitre Peak stretching upwards on the far side. It required some trial and error to find the safest route up out of the notch. But in the calm, dry conditions we enjoyed, there was no need for a rope, just patience and concentration, particularly for the first fifty or so metres. I must confess that Mitre Peak continued to surprise me all the way though. After the crux I’d expected that the gradient would relent more than it did. All the way to our turn around point at 1,430m exposure was ever present and steep stair cases continued to present themselves. This image - Leaving the steepest crux portion directly above the notch, at about 1,350m. This image - Descending the crux on the upper side of the notch. I would have loved to get to the top, but we were all satisfied that our retreat was the right call on the day. Will I be back for another crack? Probably not. As I get older I seem to stomach sustained exposure less and the ratio of type two to type one fun is not ideal. But if I did return I would only do so in a perfect two day weather window, in midsummer when there’s plenty of daylight to work with. I would swap climbing gear for more water, then go for the top on day one, then bivy at the 730m camp. On the way back to Deepwater Basin Dion told us that only about a third of his clients reach the top. He also told us that a local had once completed the climb, including a self-paddle to and from, in nine hours. In bare feet! Recently that record has been reduce to seven hours. Madness. This image - Descending the crux on the upper side of the notch.